The nominal subject of this series – The Susquehanna Trail, Road of Never-Ending Delight – is the route between Welch’s home in Lancaster, Pennsylvania and her grandparent’s home in Williamsport. The experience of riding in the backseat of her parent’s car watching the world run past her projected on the side window, has, to a large degree informed her understanding of the landscape and inspired her work for more than twenty years. Several years ago, Welch discovered a 1929 Williamsport Chamber of Commerce booklet, The Susquehanna Trail, produced to entice tourists to travel on a “trail” (once followed by the Iroquois to their council fires) that ran from Washington D.C., through Lycoming County, to Niagara Falls. Readers were encouraged to enjoy the attractions found along A Ribbon of Concrete thru The American Beautyland–thru Charming Valleys, Inspiring Hills and Majestic Mountains–the Road of Never-Ending Delight. It occurred to Welch that this auto trail symbolized ideas central to the American psyche, the history of our democratic experiment and our fascination with natural wonder. 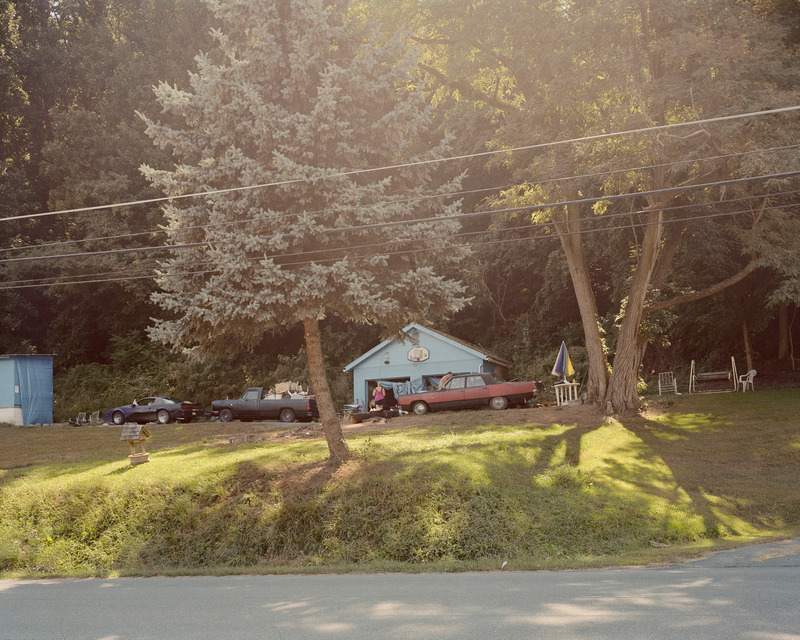 These images show the domesticated landscape in a part of Pennsylvania which is often overlooked. They exhibit the intense beauty of realism not the easy version of a Beautyland. That beauty lives in the way color, light and atmosphere transform the ordinary into the extraordinary. Welch wants her viewers to feel the awe and melancholy she did seeing the deer target in the late afternoon light through the smoke of an autumn fire and to feel disquieted by the irony of the lawn mower in the wilderness. For her, the Road of Never-Ending Delight is beautiful in its ambiguity and complexity.